VISSCHER -Orbis Terrarum Tabula Recens ..
VISSCHER, N. - Orbis Terrarum Tabula Recens ..
Orbis Terrarum Tabula Recens .. - VISSCHER, N.
Map maker : VISSCHER, N.. Size : 12.0 x 18.9 inches. / 30.5 x 48.0 cm. Description :Superb double hemisphere world map, surrounded by engravings including allegorical representations of the continents as well as native inhabitants and wildlife. 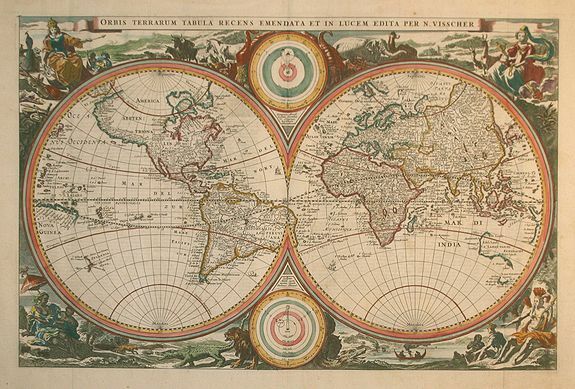 Visscher's decorations were so popular, they were copied by several other cartographers. Two diagrams depicting the Ptolemaic and Copernican theories of the solar system. The Northwest coast of North America is greatly exaggerated and shows California as a peninsula. Western Australia, Van Diemen's Land and a bit of New Zealand are marked. Condition : A small tear of 1.5cm has been repaired in the under diagram, further in very good condition.